Visit McDonald's in Gateway Retail Park on Acom Way, a 1.34 mile drive north-east of the centre of Banbury (aside Junction 11 of M40). This restaurant is handy for the people of Hanwell Fields, Grimsbury, Little Bourton, Chacombe, Ruscote, Overthorpe, Cropredy, Banbury, Warkworth and Middleton Cheney. Doors are open today (Thursday) nonstop, if you'd like to visit. Refer to this page for the specifics on McDonald's Banbury, Gateway Retail Park, including the hours of business, location description, customer reviews and other information. McDonald's is set near the roundabout of Hennef Way, Wildmere Road and Ermont Way, in Banbury, Oxfordshire, at Gateway Retail Park. Only a 1 minute drive time from Banbury Road, Ermont Way, Hennef Way and Junction 11 of M40; and a 3 minute trip from Ruscote Avenue, Southam Road and Overthorpe Road. Users of GPS units should enter the following postcode to get to this restaurant: OX16 3AB. You can reach the restaurant by buses running to Ermont Way/Stroud Park and Gateway Retail Park. Take the services 132, 200, 499, 500, B6, The Airline BHX or The Airline OXF. You may travel by train to Banbury Station (1.40 mi away). Transportation is easily accessible along the CrossCountry, GWR and Chiltern Railways lines. On foot there is Castle Quay Shopping Centre, Carrdus School, Moorfield Park, Beaumont Industrial Estate, Stroud Park, Wildmere Industrial Estate, Thorpe Way Industrial Estate and Spiceball Park. The total number of McDonald's branches currently open in Banbury, Oxfordshire is 3. Refer to this link for a complete listing of every McDonald's location near Banbury. Please take into consideration that UK legal holidays may prompt updates to the daily hours of operation for McDonald's in Banbury, Gateway Retail Park. In the year of 2019 the revisions pertain to Christmas Day, New Year's Day, Easter or Summer Bank Holiday. 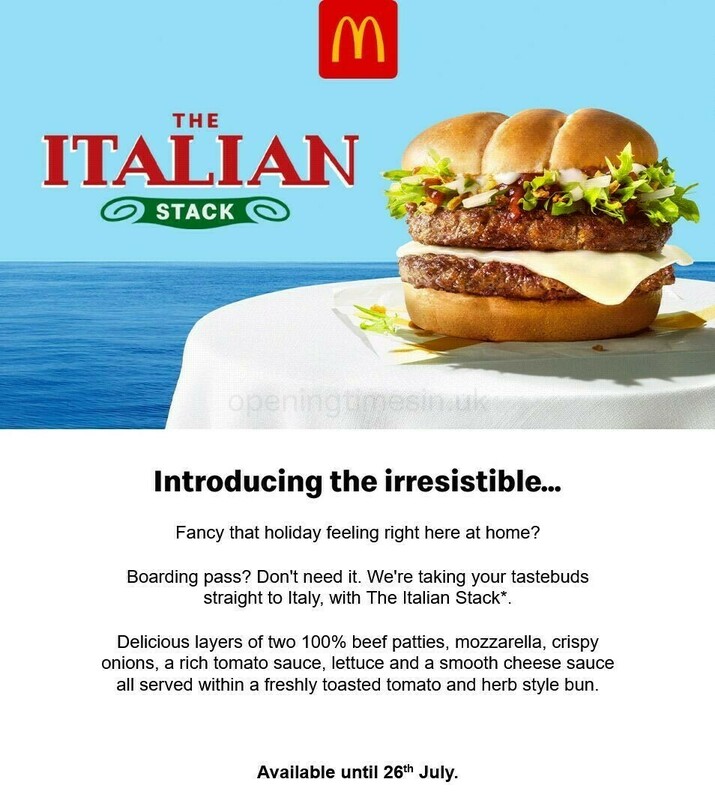 To get further details about holiday business hours for McDonald's Banbury, Gateway Retail Park, visit the official homepage or call the direct line at 370 524 4622. Visit Gateway Retail Park today for a wide assortment of stores and great offers. Additional shops such as Next, Marks & Spencer and Poundland can be found here. We are always striving to provide you with the most current information. Please feel free to make use of the report a problem form to report any errors with the place of business info or working times for McDonald's in Banbury, Gateway Retail Park. Your thoughts are appreciated. Please critique McDonald's in the space and star scale provided below.